The five three-story villas that are El Paseo Hotel have always been a bohemian's dream. Originally built in 1925 as apartment buildings in the Mediterranean Revival style, our Miami Beach hotel on Española Way features elements of Spanish, Moroccan, Italian, and French architecture, including tile roofs, rounded archways, and charming balconies. Not surprisingly, its soulful style appealed to Cuban artists who came to live here in the 1950s and 60s. For 25 years, the building was known as the Española Way Art Center, housing such notable artists as Kenny Scharf, Miralda, and Craig Coleman. Today, El Paseo Hotel is a charming boutique hotel that still exudes its historic Latin vibe. Some rooms and suites have full-service kitchens, giving guests an authentic Miami Beach pied-a-terre experience. If you feel the need to pick up a pen or paintbrush while you're here, there's a whole lot of history backing you up. On a draft table in the early 1920s, architect Robert Taylor imagined "places where artists and lovers of the artistic might congregate amid congenial surroundings." He dreamed of Miami Beach having a Latin Greenwich Village of fiestas and song, mantillas and lace. He modeled Española Way after the most walkable and delightful places in Spain and France. He was inspired by iconic Las Ramblas in Barcelona and the villages of Biarritz, Cannes and Mentone. When finally built, Española Way was the perfect place for the wealthy, such as Harvey Firestone, J.C. Penney and Harry C. Stutz, to enjoy a secluded holiday, lined with shops and restaurants that rivaled Paris. Then came the roaring 20s and 30s, when the street came alive with parties, bookies and bootleggers. Al Capone ran a gambling ring here, and in the 40s Desi Arnaz ignited the rumba craze. Today, the street is alive with shops, restaurants, and bars that attract bohemians and artists. 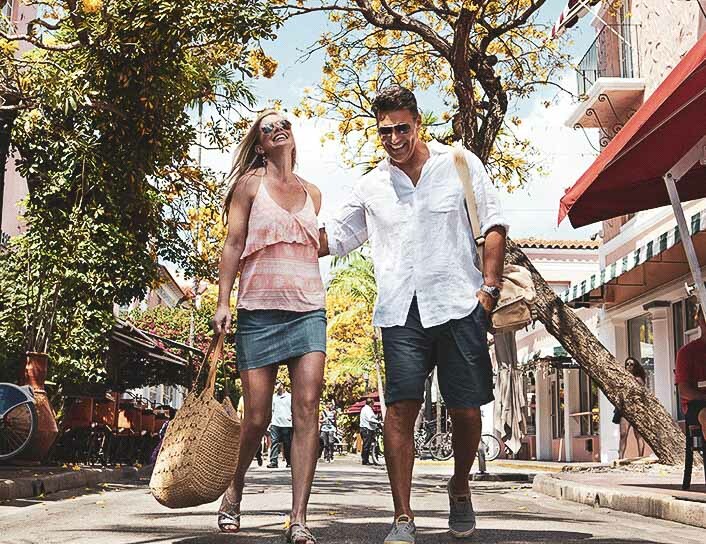 Walk along Española Way and experience a different, authentic and enchanting side of South Beach.